I finally got to put one of my wreck jars to its intended use by filling it with a small-batch of homemade jam! It is easy to make, beautiful to look at, and delicious to eat. 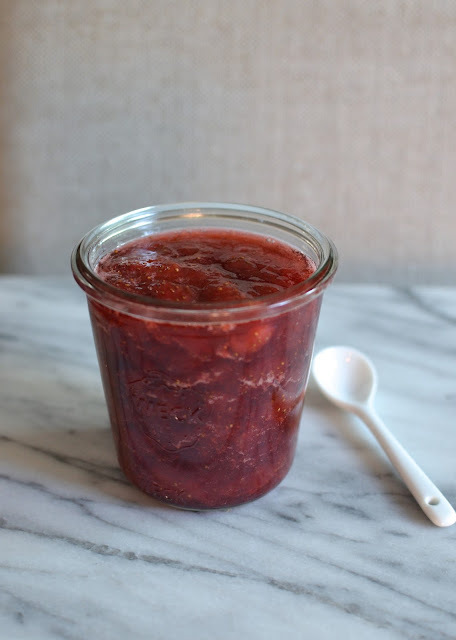 I've had easy strawberry jam, or "refrigerator jam", on my to-try list for a long time but it was Tricia's beautiful post on her blog, Saving Room for Dessert, that motivated me to finally do it. Take a look at her gorgeous photos and I challenge you not to want to go straight out to buy some strawberries and make this jam. Tricia, I hope you agree that imitation is the sincerest form of flattery because I tried very hard to imitate you and your results in this case. Since this was as easy to make and as tasty as you said it would be, I think I did pretty well! I followed Tricia's sage advice to use Grand Marnier (instead of lemon juice) in the jam. Maybe you can't exactly pinpoint the liqueur but I know it does something magical in there. This was definitely a worthwhile use of 2 cups of strawberries. In a matter of 10-15 minutes, I had a thick, vibrant-red, sweet jam - ready to be enjoyed for breakfast. My husband, who loves strawberry jam, was very impressed and we are both enjoying the fruits of my minimal labor. I only made one cup so it's going went fast! There are many ways to enjoy this homemade jam - from simply spreading it on top of toast or biscuits, to serving it with pancakes or crepes. I took a few spoonfuls and stirred it into a batch of homemade Philadelphia-style vanilla bean ice cream! My husband loved this ice cream. The eggless vanilla ice cream really showcases the vanilla flavor while the strawberry jam adds a level of sweetness and fruitiness. Both have strong flavors but stand on its own as well as combined nicely together. I started my small jam project with 2 cups of chopped strawberries, in which I'll end up with about 1 cup of jam. I was happy to read from David Lebovitz that fruit and berry jams are best made in small batches because the shorter the cooking time, the better the flavor! Then I added a cup of sugar. I was tempted to dial down the sugar but stopped myself because I also read and was reminded that sugar acts as both thickener and preservative for the jam so you can't skimp too much. I certainly didn't want my jam not to set. After the sugar, I stirred in a tablespoon of Grand Marnier orange liqueur. In retrospect, I probably should have used a bigger pan! The jam will bubble (and foam) as it cooks so a little extra space would have been smarter. I kept a close eye on it though and it was not a problem. It really only takes about 10 minutes or so of cooking - stirring and skimming away the foam that comes to the surface of the jam - before it's ready. I took the instructions to freeze a plate and then place a small spoonful of the jam on it to test for readiness; if it flows ever so slowly after sitting on the plate for 30 seconds, you're good to go. I really couldn't believe how quick and easy the process was! I felt like a wizard, conjuring up this fresh jam in minutes. Finally, if you're making ice cream like I am or find yourself with some good vanilla ice cream, try adding some of your jam into it! Right after churning a batch of vanilla bean ice cream, I scooped some aside and very lightly stirred in a few spoonfuls of the strawberry jam. You don't need very much to add a nice pop of flavor and color! Many thanks to Tricia for providing the motivation to finally make some truly easy jam. It was really fun! Place a clean plate in the freezer (this will be used to test the jam for doneness later). Place strawberries, sugar, and Grand Marnier (or lemon juice) into a medium saucepan over medium-heat. Cook, stirring until mixture comes to a boil. As you cook, skim and discard the foam that forms on top of the jam. You should be able to get most of the foam but it's fine if you don't get it all. Continue cooking, and stirring, until jam thickens, about 10 minutes. To test the jam's readiness, take the plate out of the freezer and place a small spoonful of jam on it. Let sit for 30 seconds, then tilt the plate. If the jam is thick and flows slowly, it is ready; if it slides down the plate, keep cooking. Continue to cook and test every 2 minutes; do not overcook. Place jam into a jar and let cool to room temperature. Store cooled jam in the refrigerator for up to 2-3 weeks. Place homemade or store-bought vanilla ice cream in a large bowl. It's best if ice cream is soft (freshly churned) or allowed to soften slightly. Add desired amount of strawberry jam and lightly fold into the ice cream, leaving streaks. I find that you don't need a lot of jam; I'd say approximately 2/3 cup of jam to 1 quart of vanilla ice cream would suffice. Yeah Monica! I am so glad you liked it. I think it absolutely beautiful and love your step by step instructions. That ice cream is absolutely brillant! The color added by the jam is perfection. Thank you for all the kind words and link-love. I am thrilled and you made my day :) Thanks again. Absolutely delicious! I need to make a batch too, Monica, so I can have ice cream ready for the weekend. I hear you! It feels so amazing to be serving your own homemade jam - who knew it could actually be so easy! It literally takes 10 minutes or so to cook...crazy easy, Kelly! : ) Hope you and the kids are well and enjoying these longer days. I am alll about the small batch jams - I have zero desire to learn how to can so small it is! This looks just perfect for summer! I can think of so many delicious ways to put this to use! I love making jam...and I am loving the idea of using jam in ice cream to make the swirl...thanks for the recipe Monica! Why not, right? ; ) You have a great rest of the week, too. Your strawberry jam looks so good, and I love how simple the recipe is! the idea of stirring the jam in vanilla ice cream is amazing! This jam looks perfect! I love the idea of adding it to ice cream or to Greek yogurt! What a great idea to add some to frozen yogurt! Yum! 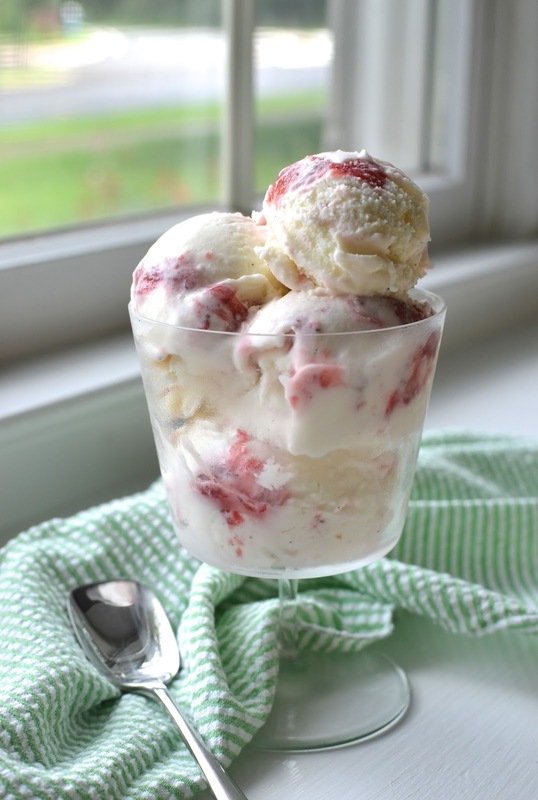 Hi Monica, the strawberries are so perfect right now, I had pinned Tricia's jam recipe too, just cannot keep them around long enough to make my own, love that you added the jam to ice cream, looks seriously good. Tricia's post and those gorgeous photos finally got me to make it. Like you, I can never hold back from eating the berries to actually do much with them! Totally worth it. Very tasty and super easy. What a terrific idea to use some of that lovely jam in the homemade ice cream. It must have been delicious. Each summer for the 4th of July, my parents made strawberry or peach ice cream. I think they would have loved your version. Oh, that sounds like a delicious and lovely tradition. I'm so glad this reminded you of that. I love Grand Marnier but never added it to jams, sounds great!And that ice cream looks amazing as well. I love Grand Marnier, too! Thanks, Adina. It is the time for strawberries. That ice cream looks GORGEOUS, Monica. When strawberries are in season and good, they are just sooo good! Thank you, Mariana. I can think of so many uses for this jam! Next time I make pancakes this is definitely going on top! What a fabulous looking jam. Love that there's Grand Marnier in it. Must taste incredible! It was definitely a good addition! Very easy and tasty, Christin. That jam looks wonderful! I am a big fan of home made jams and will convert any fruit into jam which I then sandwich between my cakes. If you can, try making raspberry chia jam...it's got the best texture and flavour I've ever had. And yes, ice cream and jam...oh so good! Oh my, your jams must be wonderful! Sounds great as a filling for cakes! It went really fast, thanks! ohhhh my! these ice-cream looks fantastic! The home made jam must be delicious too! You're a fantastic cook! It's such a simple recipe and really works - hope you give it a try one day, Marcela. Wonderfully done, Monica! I enjoyed making this recipe too. It's easy and delicious! Wow ... your jam and your ice cream both look spectacular! And by coincidence, I've featured one of your recipes on my blog today. We really enjoyed the tahini-roasted cauliflower - it's definitely a keeper. Thank you, Beth...and thank you for telling me about the cauliflower dish; I will check it out! I've made it several times...definitely a keeper, as you said. Glad you liked it, too. I love homemade strawberry jam and how lovely to add it to ice cream! Thanks, Caroline. I didn't realize it was quite so easy to make!